I am delighted to bring you my first guest blog post – by Alice Hunter. If you would be interested in contributing a Guest Blog post, please do get in touch with me! Alice Hunter is a Cambridgeshire based wildlife photographer who also takes landscape images from time to time. Alice is also a writer and speaker on wildlife subjects, as well as a tour leader on photographic and wildlife watching holidays for several companies. You can find more of Alice’s work on her website or follow her on facebook or twitter for regular updates! One of my favourite aspects of summer is the amount and diversity of life that suddenly appears around us. Insects are particularly fascinating for me and one group holds a special appeal; the Odonata. For those of you that are unfamiliar with this taxonomic name, I am referring to the dragonflies and damselflies, which for me signify summer’s arrival just as much as the influx of butterflies in my garden. These strange creatures seem almost to rattle on taking flight and despite their dainty appearance they have a voracious appetite and a fearsome hunting reputation. They have been around in one guise or another for millions of years, with early specimens being many times larger than those we know today. The colours of our modern-day dragonflies are simply stunning, so although fossils yield little clue as to whether their ancestors were similarly brilliant we can only assume that if they were, they would have been an incredible sight to behold. Within the Odonata we have two distinct sub-orders; the Anisoptera or true dragonflies and the Zygoptera which are the daintier damselflies. These comprise 42 species which are resident in the UK and a few others which are vagrants that occasionally turn up on British shores. My personal favourites have to be the Demoiselles. These are slightly larger than other damselflies and can be easily identified by their glossy bodies and coloured rather than clear wings. We have two species in the UK, the Banded and the Beautiful. The former has broad stripes of black across the outer half of the wing while the latter has a completely coloured wing which is a rich chocolatey brown. The aerial part of their lifecycle is often the only part we see, though I find myself in a privileged position to be able to pond dip on a regular basis as an adult. There is certainly something of a child-like joy and excitement at watching an adult emerge from its alien looking larval form on a waterside plant. I have seen a few very newly emerged adults this year, from a female Large Red Damselfly which had yet to take on its full red colour to a Four Spotted Chaser whose spots hadn’t darkened on the wings yet. As a photographer I enjoy a challenge and the task to photograph a dragonfly in flight has been one I’ve tried time and again to achieve. I finally managed an image I was pleased with at the end of last summer when I got the chance to snap this Southern Hawker over an ornamental pond. Photographing these beautiful insects is something which I enjoy enormously and there are a great many species which I have yet to see let alone capture in an image. I will always be looking for a picture better than one I already have or a new and different angle. I hope that my images have inspired you to take a closer look at some of these wonderful creatures and perhaps to have a go at photographing them yourself. The Early Mining Bee is the first solitary bee I ever took note of. I spotted one pottering around on the garden table a couple of years ago and didn’t know what this charming little creature could be. Luckily it happened to be one of the most easily identifiable mining bees – subsequent efforts at identification have been a rather more mixed success but I do have a soft spot for this one. The Early Mining Bee – Andrena haemorrhoa in the latin – is one of the larger mining bees and nests solitarily, although there may be loose aggregations of nesting females where the habitat is suitable. I spotted this one searching for its nesting hole in our back garden before disappearing down the tiny, perfectly round hole. A few moments later, when my elbows and knees were already getting sore, it popped back out. It pauses a moment, has a preen, seems slightly startled by a Chocolate Mining Bee (Andrena scotica) which was buzzing around above it, and then hops out and flies back away. I often see these holes, and it was a real treat to actually watch the bee emerge. The Early Mining Bee is common across the UK, and are fairly generalist in terms of the flower species they visit which makes them well suited to our gardens where they are regularly seen foraging and nesting. You can read more about mining bees, and what takes place below the ground, in Brigit Strawbridge’s excellent blog post on the subject here. One of the earliest bees to appear in the garden is Anthophora plumipes – also known as the feather-footed or hairy-footed flower bee. These are almost bumblebee-sized solitary bees which buzz at high speed from flower to flower. The lungwort (Pulmonaria spp.) in the garden seems a particular favourite! The males and females are easily told apart by their colour – the males are a gingery brown whilst the females are almost jet black. I have often seen them visiting flowers, but have never before come across a nest site. At the Barrington Court National Trust property in Somerset, I spotted several of the females investigating holes in the wall of an old stable. There were lots of nooks and crannies in the old pointing of the wall and the bees were flying into these to investigate. If they liked the site, they stayed and began work on excavating, pushing tiny fragments of material out of the hole to create a nest chamber. Often however, the hole seemed not to their liking and they tumbled back out and continued their search. One of my favourite uses of modern technology is to gain little insights into something usually difficult to perceive – I think this is a nice example. Using the iPhone camera on slow motion video, I managed to get a few shots of the bees leaving the holes. They seem to tumble back and away from the hole and pause for a moment before continuing their search. Whether this is to steady themselves after their rather ungracious exit, or whether this is to conclude their inspection I am unsure, but the behaviour was quite consistent with different bees. The clip also shows how easily these powerful little bees can deal with the cobwebs of spiders which seem to share their taste in residences! Lots more info on these bees can be found here! With a couple of hours of free time to explore, there could be little more enticing than a footpath along a wooded river in North Wales. It was a little early for some of the spring flowers to be fully out, but there was more than enough to keep me busy! Just below the bridge at Llanystumdwy, I watched a dipper on the rocks which was soon joined by a second which flew from downstream. They proceeded to perform a courtship display which was a treat to watch, but was poorly captured due to the wrong lens I’m afraid! Daffodils are widely naturalised as ornamentals, but there are natives amongst them – Narcissus pseudonarcissus subspecies pseudonarcissus. Some of these will be naturalised natives – ie. those of the native variety which have nonetheless been planted as ornamentals. There were several patches of obviously ornamental daffodils along the river, but some looked tantalisingly like the natives – with the grey-green leaves, lighter outer petals around a yellow trumpet and their lack of other ornementation. Also their positioning was often far from where you would choose to plant a daffodil, in awkward locations or almost out of sight. Wild primroses – Primula vulgaris – were scattered throughout the wooded banks of the river – these are an ancestor of many of our more colourful garden varieties. Marsh marigold or kingcup – Caltha palustris – was flowering in wet flushes which creep across the path to join the river. These are a member of the buttercup family and were growing alongside one of their diminutive cousins – the lesser celandine. Opposite-leaved golden saxifrage – Chrysosplenium oppositifolium – is a common low-growing species around damp habitats such as along streams and rivers. Its lime-green flowers are more prominant than you might expect and light up damp patches of the banks. This is a closeup photo of the flowers of dog’s mercury – Murcuralis perennis – a very typical flower of older woodlands. These wood anemone – Anemone nemerosa – were just beginning to come into flower, rather behind many woodlands further south and east. These strange structures are the sporophtes of a liverwort – one of the Pellia species – which was growing amongst the rocks. The spores are held aloft on these thin, filaments called the thallus. The brown coloured capsules are open and releasing spores to seed the next generation. We stopped off in Portmeirion in Wales, on the way back from a couple of days in Harlech, and were having a bite to eat in the carpark before heading home. A couple of robins, clearly used to picking up after picnics, hopped down to grab what crumbs they could. I set the camera onto slow-motion video, placed it down pointing towards a scrap and crossed my fingers! I like how dynamic and powerful such a small bird looks from this angle – it’s purpose of motion and the accuracy of the grab are impressive. For a screature which relies upon seizing an opportunity to take a morsel of food, and then getting back out of range of predators, the little robin is perfectly adapted! Springtime sees the movement of amphibians from their overwintering sites back to their breeding ponds to meet, mate and lay their eggs. 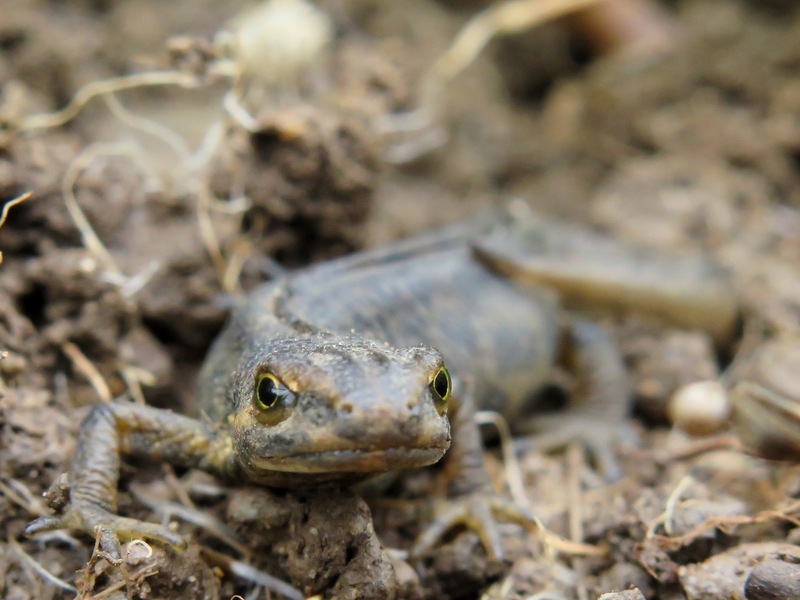 Last week we had our first frogspawn of the year in the garden pond – two clumps which have subsequently been joined by a further twenty-two and the sound of mating calls suggests they are in no hurry to slow down! Newts tend to breed a little later, and I found three smooth newts (Lissotriton vulgaris) sheltering under a log yesterday. 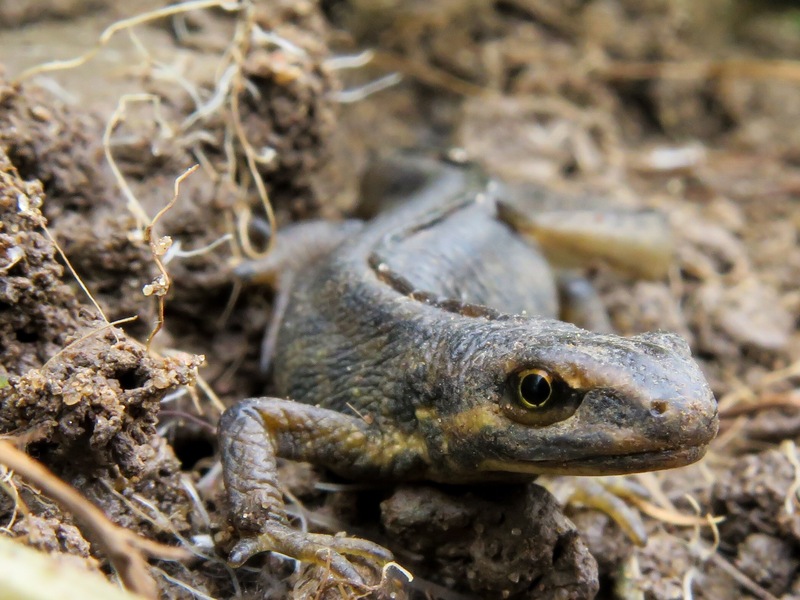 Newts, like all UK amphibians, spend a fair bit of their time in ‘terrestrial habitat’, that is in habitat around the ponds such as grasslands, woodlands and areas of scrub, as well as whatever gardens their ponds happen to be surrounded by. 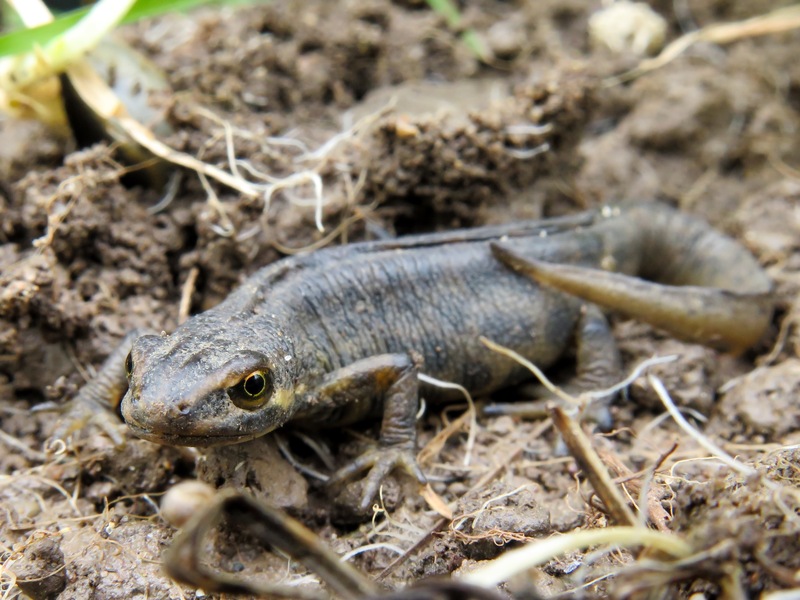 The mild winter has led to confusion for some species, and Froglife tweeted that their monitoring suggested that newts haven’t hibernated this year. The three individuals I saw certainly looked wide awake and ready to go in 2016 – it will remain to be seen whether the unusual conditions, and impacts on behaviour, will affect the conservation status of these species. I spotted movement in the pond as I walked down the path last night and on closer inspection, it was a small number of frogs who quickly bolted beneath the water but soon bobbed back to the surface again. More excitingly, there were two clumps of frogspawn! We went out for a walk later in the evening and had another look as we passed by, sure enough there were a coupled frogs visible by torchlight. This morning, the number of clumps had grown from two to nine overnight. The temperatures had dropped below freezing, as evidenced by the white frosting on the grass and the ice on top of the frogspawn, but this seemed to do little to deter them. Nature’s Calendar has average first sighting of frogspawn over the last few years – the 2016 data is still being gathered but the average for the period 2012 – 2015 varies between 2nd and 17th March, making the 9th March an approximately average first-sighting! If you spot frogspawn, you can help contribute to scientific data by recording your sighting at Nature’s Calendar and the Big Spawn Count.